Mabitac, a town said to named after a legend about the town that's full of traps, called bitag in Filipino, and is the border town of Laguna province with Rizal's Pililla town. 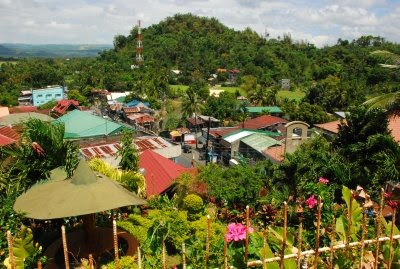 It's bounded by the towns of Siniloan and Famy, favorite getaways of newbie mountaineers wishing to trek the slopes of Mt. Romelo and it's various waterfalls. 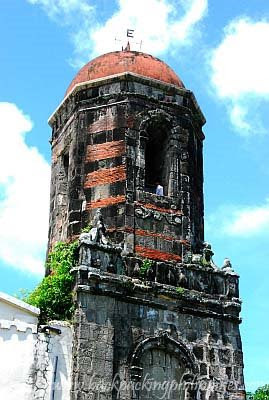 Due to earthquakes, only the belltower of the old church remains and no attempt at restoring the old church was made. Mabitac Church, as mentioned above, is located on a hill top that visitors will be treated to a refreshing view of the surrounding green sceneries like the one of Mabitac town proper below. 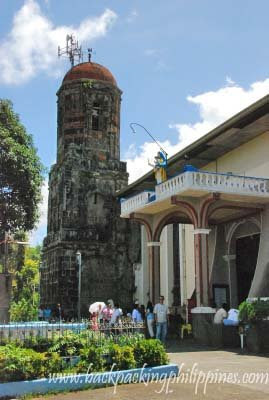 Near Mabitac Church is the National Historical Marker commemorating the Battle of Mabitac, previously known as the Battle of Hinukay, that occurred during the Philippine-American War where the Americans faced defeat at the hands of the ragtag army of Filipinos mainly due to superior positioning. Commute: Board a HM Transport bus, with terminal on EDSA, Cubao near Victory Liner, going to Sta. Cruz/Calamba or Green Star Express with terminal on Taft Avenue near corner Gil Puyat (Buendia) and LRT Gil Puyat station then drop off at the terminal in Pagsanjan. Board a jeepney bound for Siniloan. At Siniloan Public Market, transfer to a tricycle to take you to Mabitac town. An alternative and easier bus to Mabitac is Raymond Transportation with terminals in Cubao (near Victory Liner) or Legarda St in Manila near Nagtahan. Buses going to Infanta and Real towns in Quezon pass by Mabitac Junction where you only need to take a tricycle going to the town proper. Driving Directions from Makati: from SLEX take Calamba exit then head straight to Calamba. turn right at Calamba junction and follow this road and highway where you pass by Los Banos, Bay, Victoria, Pila, Sta Cruz, Pagsanjan, Lumban, Kalayaan, Paete, Pakil, Pangil, Siniloan then Mabitac. Directions by car from Quezon City, it's faster to take the Rizal route by going to Marcos Highway, turn right at the junction Masinag Wet and Dry Market, on reaching Antipolo intersection turn left going to Baras (straight ahead leads to Antipolo Church while a right turn leads to Hinulugang Taktak) where you'll pass by Teresa, Morong, Baras, Tanay, and Pililla towns of Rizal province before reaching the Laguna town of Mabitac. From Lucena and Lucban, Quezon: there are jeepneys plying the route Lucena to Sta. Cruz that pass by Pagsanjan, Cavinti and Luisina. In Pagsanjan, Transfer to jeepneys going to Siniloan then transfer again to a tricycyle to take you to Mabitac. Commuting from Cavite: board the Pagsanjan or Sta. Cruz vans at Pala-pala terminal in Dasmarinas, Cavite (near Robinsons Dasmarinas and SM). Board a jeep to Siniloan then a tricycle to Mabitac. And the celebrate the Feast of the Three Kings every January 6.
i love old bell towers! they have character. hehe. nice post and a gud information from u.hope i can visit those places sometimes.thanks for dropping by.keep in touch. nice post and a nice information for the readers.hope i can find some time to visit these places.all the best for ur work. nice church..for me it's enticing to see and explore old historical places. there's a sense of wonder just how our old forefathers fought for their lands. it's actually 126 steps to be exact. And that is the truth. im from Mabitac laguna, the EXACT step is 126steps. I'm from Mabitac, Laguna, if you are a first timer in our town Mabitac especially in our Parish Nuestra Sr. De Candelaria and you count the stairs of the church correctly, May chance po kau mag wish ng 3 and it will be granted for sure. Planning to do this tomorrow,Sunday; together with Sta. Maria and Churches on the way to Paete. Thanks for the idea. Hi, good day!FYI: every year we're celebrating "THREE KINGS" onp the 6th day of January. It's a tradition and a wonderful scenario that most people will surely like!!! Happy three kings, everyone! As for me, there are 127 steps going up to the church since they have add a new one; stairways to heaven.